The final volume, entitled The Psalms of David in Meeter: newly Translated and diligently compared with the Original Text and Former Translations, etc. Allowed by the Authority of the General Assembly of the Kirk of Scotland was agreed on 8th January 1650. (see page 94 here). This continued as the standard Psalter well into the 20th Century, around 1930. (Matthew McKail had been minister at Carmunnock south of Glasgow from 1639–1649, and then moved to nearby Bothwell. The Salty Scrivener blog has an excellent telling of the horrific torture and martyrdom of his brother Hugh's son and namesake, young Hugh McKail). Over Christmas, a man I know well reported to me that he had just changed optician. On his first visit to the new one, he was told that he was descended from people from the west of Scotland, as his eye was identical to the eye shape of people there. The optician had studied at a university and then worked in Scotland for many years. This was a new one to me but I am thinking of paying a visit for my own research purposes. This man – known variously as Alexander Alane / Alesius / Ales / Aless – keeps popping up in recent reading. A native of Edinburgh, born in 1500, he was in Fife when young Patrick Hamilton, not long back from Luther's Germany, was arrested and trialled before a kangaroo church court. Alesius played an important role linking the Reformations of Scotland, then Germany, then England. He is believed to have been planning to translate Luther's German Bible into Scots, but it's more likely that he intended to use the original Greek and Hebrew manuscripts which Luther himself had used. Ales is said to have been the first Scot to meet Jean Calvin - this was at Worms in Germany in December 1540. In his time in England he was occasionally referred to as Alexander Alesius, Scotus, Doctor Theologiae. • The 1857 book by Peter Lorimer*, entitled Precursors of Knox, has a lengthy section on 'Alexandre Alan, or Alesius' (click here) . The back of the book shows that Lorimer intended to publish a standalone biography of Alane, entitled Alexander Alane, commonly called Alesius, the Wanderer, but this may have been publishers' enthusiasm as I've not been able to find it anywhere. • Various footnotes from p232 onwards contain a lot of detail about Alesius work and writings, including his eyewitnesa account of the martyrdom of Patrick Hamilton (in the original Latin) on p236, and details of his change of surname from Alane to Alesius (p241). • Lorimer's work The Scottish Reformation A Historical Sketch has much on Alesius, in chapter I section IV and in chapter II section III (click here), including a letter he wrote to Philip Melancthon describing a brutal martyrdom of a husband and wife in Perth in April 1544. • A very detailed and accessible account of his life can be found in Christopher Anderson's The Annals of the English Bible Vol II (1845) from p 426 onwards which is available here. This includes a very odd account from Alesius' own childhood memory where he was 'teleported' it was thought due to him wearing portions of scripture around his neck, as he says '... in certain parts of Ireland it is the practice still, to operate as a charm ...'. Not unlike Acts 8 v 39. The Historical Index at the end is a useful summary of his life. • A street in Leipzig is named after him (Alexander-Alesius-Straße, 04316 Leipzig). He was a Professor at the University from 1542–65, where he died on St Patricks Day in 1565. • A 2013 PhD thesis entitled Propaganda and Persuasion in the early Scottish Reformation by Elizabeth Leons Tapscott is online here and is packed with information about Alesius. * Rev Peter Lorimer (1812– 1879) was born in Edinburgh but moved to London and became Professor of Hebrew and Biblical Criticism at the English Presbyterian College of London (now Westminster College, Cambridge). Perhaps somewhere in the College archives are Lorimer's manuscripts on Alesius. There is an article on the College website about Lorimer. ** Christopher Anderson (1782–1852) was also Edinburgh born, founder of the Gaelic School Society and the Edinburgh Bible Society. 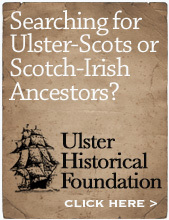 In 1830 he published Historical Sketches of the Native Irish which is available here on Archive.org. Biographical Wikipedia page here. Over the centuries, people of all colours and from all cultures have either been slaves or have traded in slaves. 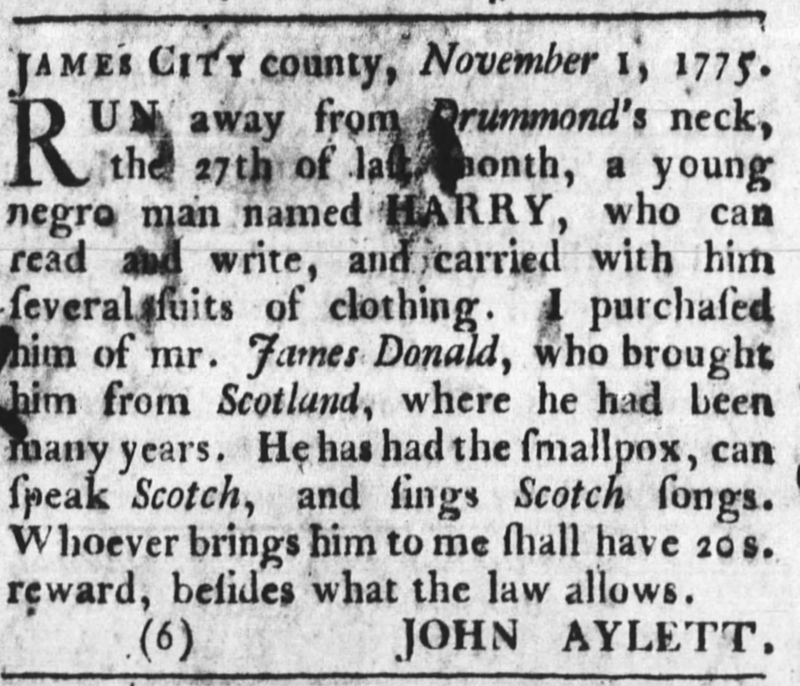 Here is an advert from the Virginia Gazette in 1775 which tells an interesting story - a black slave who could 'speak Scotch and sing Scotch songs', due to having been in Scotland for many years. 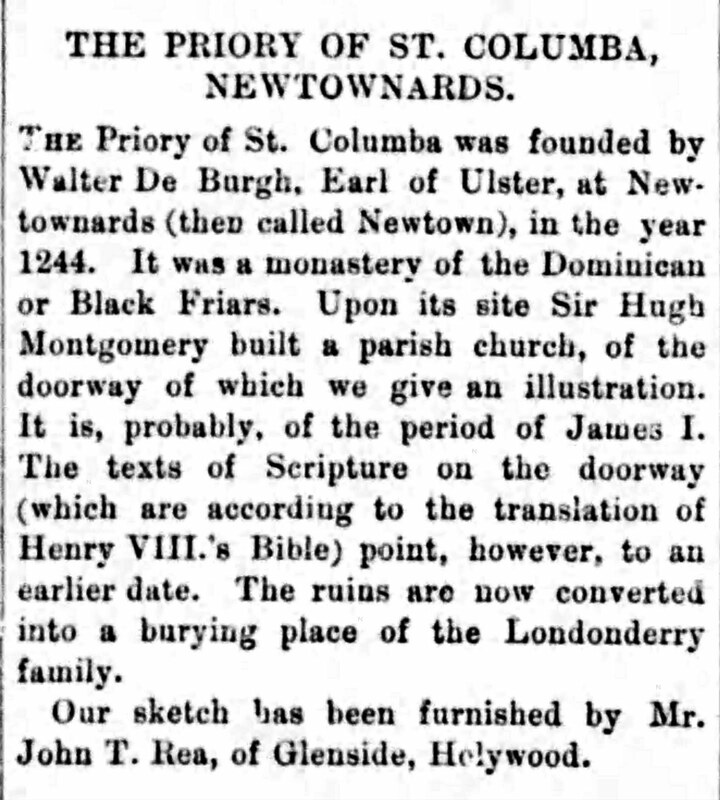 These images are from The Irish Builder, 1st November 1888. The drawing is by John T Rea of Glenside, Holywood. The reference to 'Henry VIII's Bible' would point to the William Tyndale translations of the early 1500s. The words read "Take heed to thy footsteps when thou enterest into the courts of thy God" (from Ecclesiastes 5 v 1) and "I was glad when they said unto me we will go into the house of the Lord' (Psalm 122 v 1). Others smarter than me can pin down the original source! The ornate doorway and these scriptural details were added by Sir Hugh Montgomery during his restoration of the building, thought to have been as early as 1607; a 1607 datestone inside the building today is a clue. Montgomery's in-laws, the Shaws of Greenock, were renowned stonemasons in Scotland who carried out all of the maintenance and repair work to all of the Royal buildings. 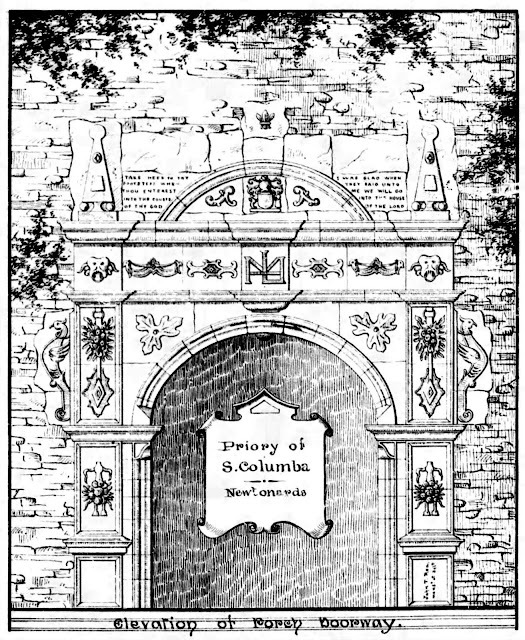 William Schaw was Master of the King's Works and reputedly the founder of another type of masonry. 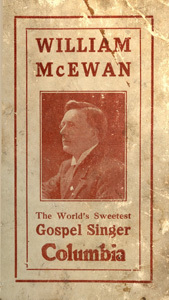 William MacEwan of Glasgow and New York (1871–1943) ........ 'The World's Sweetest Gospel Singer'. 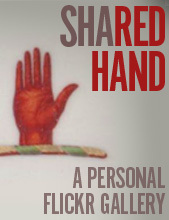 I am gradually refreshing a series of blog posts from 2011 to have their own dedicated blog which you can find here.